Barbara made a mention on her blog about the mileage on her car, and it got me thinking about how many balls of yarn goes into running my automobile. My car has one of those computerized things that will tell me how much mileage I am getting out of my current tank of gas. Right now it reads 18 miles per gallon -- or something like 13 litres per 100 km. Given that gas prices here in my town -- in the San Francisco Bay Area where gas prices are much higher than the national average -- is around $3.89 for regular unleaded and $4.12 for super unleaded, I'd have to say that it costs me one ball of my favorite yarn, Elann Luxury Merino Superwash ($3.98), to travel 18 miles. I don't even want to think about how many balls it takes to fill up the tank! Ok, I don't have to think. I know. I gassed up yesterday for $3.999 per gallon -- which I believe is around 0.68 € per litre. That came to $45.47 for 11.371 gallons of fuel, or roughly a little over a bag of Luxury Merino Superwash. It's interesting to note that my mpg has dropped slightly since moving to the new house, I guess I do more "city" driving in the suburbs. Which sounds odd since I used to live in the city. Honda's Hydrogen Fuel Cell Car, which emits water vapor. How much greener can you get? :-) (more info/stats here) It has a top speed of 100 mph, and 68 mpg equivalent (to gas engines). VW is working on a Diesel Hybrid that should get 70 mpg. I always cringe at the thought of diesel which is due primarily to my limited experience of always driving behind big old diesel trucks that stink stink STINK, however DH assures me that diesel cars today are much improved. I told him to point out when I'm driving behind a diesel sedan. Not a whole lot going on here. I'm taking a little break from cable knitting because I suspect it is causing some of my wrist pain; using the computer is the other contributer to my pains. So I started a little knit/purl project that is nice for almost mindless TV knitting. 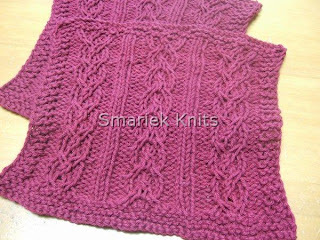 I actually picked out 2 knit/purl patterns, both with a diagonal theme, and have dubbed them Miles and Flora since they are siblings of sorts. Hmmm, is that too ominous? Anyhow, I liked this pattern for it's "manly" look, perfect for the guy who doesn't want anything too fussy. I've started the Right Front section of Mom's vest. 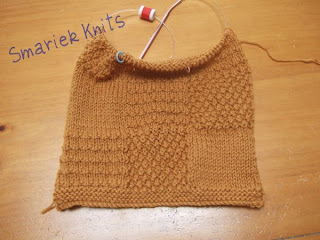 I've almost reached the point where I will need to start the armhole shaping. 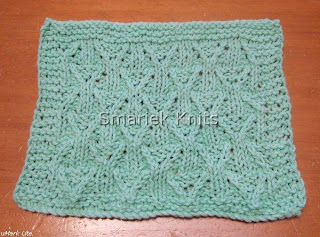 I think this pattern may be easy for most people, however I find it difficult to reverse the shaping without having everything explicitly written out in great detail. 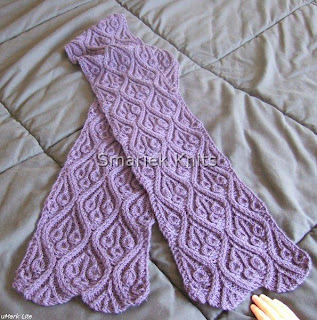 I suppose the more experienced knitters are able to do this on the fly while they are knitting. (You saw the Back and Left Front sections here). 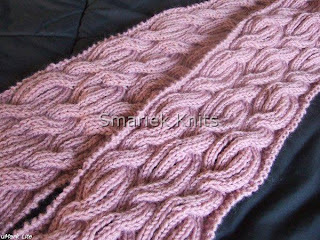 Oh, I started a cable scarf using the peachy yarn you saw here. I just chose a pattern from one of my books and tried it out. I wasn't sure how it would turn out knitted up, but I ended up liking it. I'm trying to take it easy on the cables. I do cables without a cable needle. A thought occurred to me that perhaps it might be easier on the wrists if I used a cable needle. If true, would it be worth having to slow down for a cable needle? I couldn't get a good picture of the scarf, Miss M was trying very hard to "help", and would keep moving the scarf. 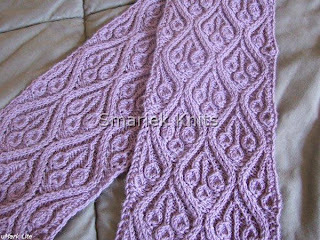 I used about 4.5 balls of Elann Highland Wool which gave a finished dimension of 20.5 cm x 154 cm (8 inch x 60.5 inch) before blocking. I did not block this scarf aggressively, so its finished size after blocking turned out to be 21.5 cm x 170 cm (8.5 inch x 67 inch). 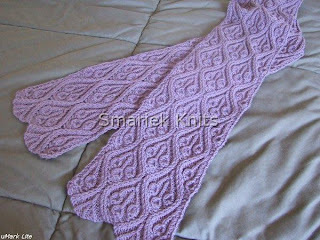 I haven't yet had a chance to take photos of this scarf after blocking, but I will do that soon. I promise. I wore my pink Regina when I visited her a few months ago and she commented on it. I was really surprised because she never comments on my knitting. I took this as a sign that she might like one of her own. So I hope she likes this. 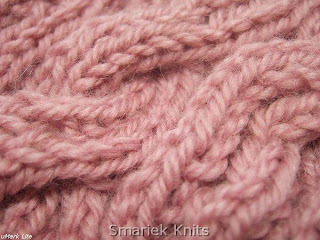 I'm using the same yarn, Elann Luxury Merino Superwash, in Ruby. I'm entertaining the idea of adding matching mitts, unfortunately Elann doesn't make Baby Cashmere yarn in Ruby color. I do like her charcoal colored mitts, and I wonder whether that color would make the mitt less feminine enough for gifting to a man. 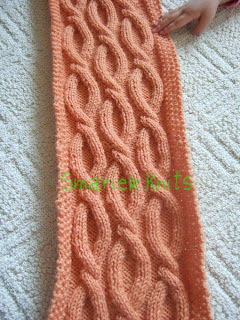 Do you think a man would wear mitts with this cable pattern if the yarn was a more manly or "tweedy" color? Well, these are the only two people I know of who has dared to try my mitt patterns. Making mitts was a fun and educational experience for me, however I can't imagine knitting more mitts anytime soon. I'm sure I'll think differently when the weather cools down in late fall or winter. I'm in the process of updating my sidebar, something which I had been meaning to do for aeons. This will take a while since I have limited computer time, so the sidebar may appear a bit wonky at times. 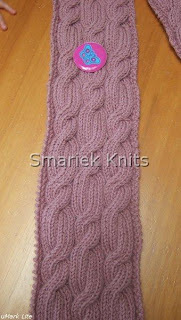 I've already started by redoing my knitting blog links, changing it from "link list" Layout Element to "html" Layout Element, and adding a new section for photography links. For those of you who use Blogger, you may recall that there used to be Old Blogger before this current incarnation known as New Blogger. Sometime during the transition to the new blogger template, I went into the Layout section and created a new Element, choosing "link list". 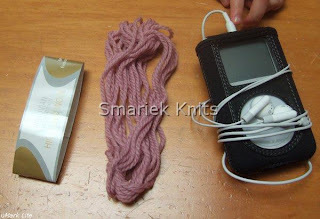 This is what my Free Patterns list is and I despise it. When you add a new link, it will appear at the very top of the list. Moving them up or down, line by line, isn't too difficult when the list is short. Unfortunately my link list has grown quite a bit and it is a real PITA to add a new link and insert it where I want it to appear. My goal is to scrap it and recreate it using the "html" Layout Element. It will be so much easier to cut/paste to rearrange things in the list. I'm thinking of removing the Google Translator widget. I'm not sure it is benefiting anyone. There are times when I see a bunch of icons there, times when only a few appear, and other times none at all. It doesn't appear reliable at all. And I suspect than anybody who needs to translate my blog into another language has their own system for doing so. Before you get excited about college football or a ski resort in California, this is about a sugar bowl which generally holds C12H22O11 (Carbon 12, Hydrogen 22, Oxygen 11; aka sucrose or table sugar). If you asked me, six months ago, what I thought about Celestial Seasonings teas, I would have told you that I didn't like them, even after trying several different flavors. They weren't weren't my cup of tea despite their popularity. I enjoyed tea(s) from other brands ubiquitously found at supermarkets, for example, Stash, Twinings, Bigelow, Tazo, Yogi, and Traditional Medicinals. What was it about Celestial Seasonings teas? I wondered for a while and finally decided to ask the tea connoisseurs on Ravelry. One person suggested adding sugar to make the fruit tea flavors pop. Eager to try this, I made some Raspberry Gardens tea -- a flavor I was not impressed with at all -- with a teaspoon of sugar. Boy did that make a difference in my tea drinking experience! The tea was much improved by this simple addition. I drink a tremendous amount of tea on a daily basis, however most of my teas are consumed unadulterated with any sweeteners or milk. I was never in the habit of adding anything to my tea and I can enjoy many black teas plain, even the ones which most people drink with milk in it. After this amazing discovery of what I've been doing wrong with the Celestial Seasonings teas, I decided it was time for me to dig out the sugar bowl. I should mention here that we don't use much sugar in our house. It is mostly used for baking, so we just measure out what we need from the 5 lb bag from the store or a large container if I have stored it in one. This is quite cumbersome when one only wants one teaspoon of tea. So I went in search of our sugar bowl, which was still packed in a box since our move to this new house back in September 2007. This is my mom's sugar bowl, it's part of a set of china which I "inherited" when we moved to the new house. The rest of the set is still packed up in boxes, along with a second set of china also "inherited" from my mom. The second set is a fancy Chinese style set which is not very practical for using, so it will most likely remain packed in boxes for a few decenniums. Sitting next to this sugar bowl is my new love. 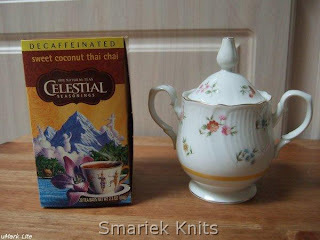 Celestial Seasonings Sweet Coconut Thai Chai tea which someone on Ravelry recommended. It is not sold at my local Safeway, however I managed to find it yesterday at Target. I made 3 cups yesterday. And Miss M enjoyed drinking half of my tea. As I was out shopping today, I managed to pick up more tea: Celestial Seasonings India Chai Spice Tea; Celestial Seasonings Fruit Tea Sampler; 2 boxes of Stash Chai Spice Black Tea. I have had the latter before, consumed plain. I intend to try it with some sugar and milk added. I have a modest tea stash in my new home. I have managed to allocate one drawer for tea, and both tea bags and loose tea are packed in quite densely. The drawer is only 58.5 cm x 52 cm x 21.5 cm (23 in x 20.5 in x 8.5 in). To make the most of the space, I have consolidated individually wrapped tea bags into boxes. I found this a better use of space than having several boxes each containing 4 or 5 tea bags in them. It may sound like a disorganized mess, but I actually know where my teas are since they are grouped by like kind. Well, sort of. Hmm... I guess it's a good thing that this blog's readability level makes it accessible to most people? 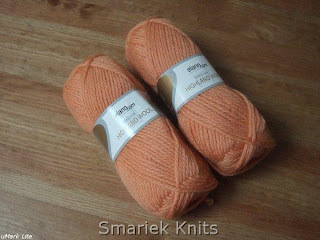 It's Elann Highland Wool in some sort of light peachy or cantaloupe color. It's not really my color, but I'm sure it is somebody's color. So what I am knitting will definitely not be for me. Then DH comes home and presents me with a tote bag. Don't get excited, it's just one of those freebie things his company gave out to celebrate their new company logo and slogan. So what will I do with this bag? In goes the peachy Highland Wool and the piece of paper with my pattern scribbles. All I need to do is hunt down a 4.5 mm needle. You'd think this would be easy since I just finished Beaumonde using that size needle. Nope, it couldn't be that easy. It's not in my circular needle storage. Where is could it have gone??? The tote is small, but it's a bit large for small projects. That won't stop me from using it as yet another WIP project bag. Please don't ask me how many WIP project bags I have roaming around the house. I've lost count, and some I haven't seen since before we moved into the new house. Very little progress on Mom's vest. I have finished the Back and Left Front sections. And I have mapped out how I will work the Right Front section, which needs to be a mirror image of the Left Front section. That's what the instructions tell you to do, but I really need it written out in more detail, so I have written out the shaping section like I did for the Left Front section. Now it's just a matter of working up to casting on for the Right Front section. 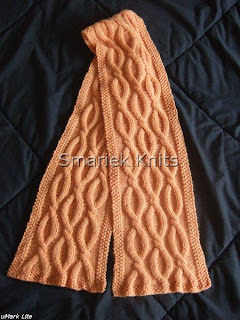 I wish there was some sort of xerox machine for knitting that would make a copy of the Left Front section. Oh, this machine would also have to have a special button that would automagically reverse the shaping too. 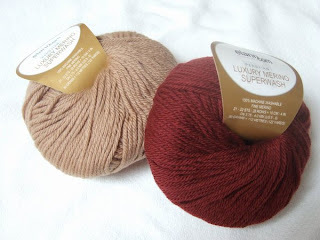 I picked up more of my favorite superwash yarn, Elann Luxury Merino Superwash, a DK weight yarn. The ball on the left is Cafe Au Lait, the ball on the right is Merlot. When I first dropped them into my shopping cart, I was thinking of using each color individually. However after I received them and had both balls next to each other, I started to think they would make a good pairing. What do you think? Ok, maybe I'm smoking crack. This yarn feels so soft in my hands whenever I work with it. 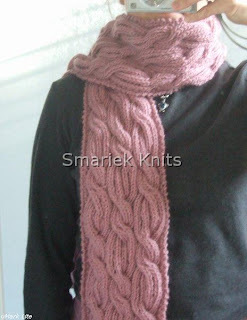 It is very noticeable when I work with some other yarn and then come back to this one. 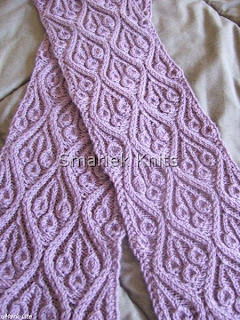 I hope Elann has no plans to discontinue this yarn, it is definitely a keeper. This is my favorite superwash wool, perfect for making gifts for machine wash friends and family. After 8 months in the new house, I have finally thought about hanging pictures. I dug out this one which was painted by my MIL's sister's husband and hung it up in the family room. It's not a very large one so I thought it would be best up above the fireplace (you can see a photo of it here). Unfortunately, I couldn't reach up high enough to stick a nail in the existing hole on the wall. Instead, I got up on the sofa which is sitting along that wall on the right side and stuck a nail in one of the existing holes in the wall. I wasn't quite ready to hammer in a new hole along that wall. The painting is definitely too small for that wall, but I'll leave it there for now until DH can find a ladder to hang it up over the fireplace. 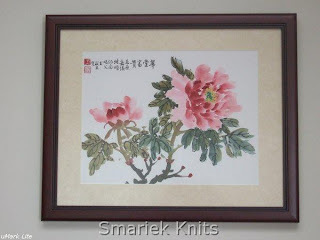 The frame is 57 cm x 46.5 cm (~ 22 in x 18 in). 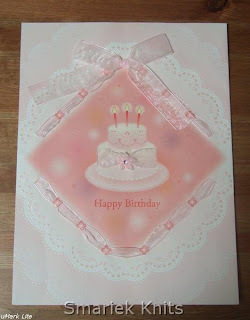 My MIL's sister was excited to find this large birthday card for Miss M. It's really quite large, it's like laying out 4 regular size cards in a 2 x 2 configuration. It's 34.5 cm x 26 cm (~ 13.5 in x 10.5 in). And she was happy to find blank space on the inside so that her husband could paint inside. They wrote a message on the right side, and next to each Chinese character they have also included the pronunciation guide that Chinese grade schoolers learn (bo po mo fo). Who knows, perhaps Miss M will someday learn it. (BTW, my Mandarin learning has come to a halt as I wait for CD set 2A to become available at the library; it was due on 6 April 2008, and it still hasn't been returned yet). After 6 months in the new house, we managed to unpack the 2-burner griddle and have been making pancakes since then. Miss M loves pancakes, however I suspect it has more to do with the maple syrup than the actual pancake. After 8 months in the new house, the original camera doohickey and Sims Makin Magic disc #1 still haven't resurfaced. There's life outside in our backyard again. Our peach tree is no longer just bare branches. Our orange tree has these little white flowers on them and they're quite fragrant. The downside to this are the ginormous buzzing insects around the tree and in the back yard. I normally think of bees as black and yellow, but there are some pure black ones out there. The bug life out there is pretty healthy (read: huge). I've seen a hummingbird out there. I'm thinking of getting a feeder, but I have no idea where I'd put it or whether I'd get eaten alive by the bug life when I attempt to put it up. There's also a family of small birds living in a nest under the overhanging roof just outside our kitchen window. I can sometimes see a head when I look up through the kitchen window. I think they chose to move into the nest there (it was there before we bought the house) because it kept them dry and safe from the fluffy dark brown cat that roams around. This cat manages to climb up onto our roof! Sadly, those mysterious "pinpoint" bugs have reappeared in our hallway bathroom again; it was nice when they disappeared during the winter. There is a door from the hallway bathroom leading out to the back yard. I'm pretty sure that's where the bugs are coming in from. I still haven't identified what sort of bug they are. I sometimes see them roaming around outside, I sometimes notice them when I'm sweeping the patio. They're smaller than ants and about the size of or smaller than a flea, a size that my non-bug-phobic DH would not notice. And when you try to squash them, they jump! I tried to do a search on insects and so far I think the they might be springtails, however I can't be 100% sure. Other insect life have started to show interest in our house again. I have see more variety and quantity of bug life at the new house since we moved in last Sept than all the bug life I had seen at the old house during the previous decades! I guess that was one nice thing about living in the city. My hands and wrists are feeling a bit better now that I have been laying off the computer use quite a bit and wearing a wrist brace. I think most of the pain is from mouse clicking. My keyboard is still configured for Dvorak, and I have considered changing it back to Qwerty to force myself to type slower. I'm also taking it easy on the knitting too. Hmmm.... I've never read Ulysses before and I'm not quite ready to tackle that one anytime soon. The nice thing about this quiz is that it's a quick one, perfect for someone with a short attention span like myself. There are only 6 or 7 questions. I can't seem to focus on anything very well these days. I'm still experiencing pain and numbness in my hands, wrists, and arm which is most likely due to the computer and knitting. I've been trying to take a break from both. If only I could do these two things without using my hands! My knitting and computer time is more limited than before since Miss M is shaking off her afternoon nap. I don't really get any down time for myself. She doesn't let me do either activities when she's around because my attention is not on her and she doesn't like that. Oh, that photo above is just something I've been pushing around my needles, however I've put it on hold because of all the pain I'm experiencing. 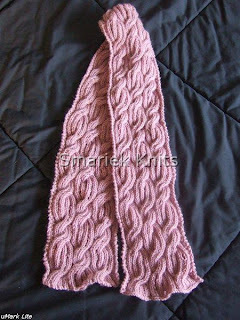 It's just a little cable scarf knit in Elann Highland Wool in Orchid Pink. I've spent more time trying to learn Mandarin, and reading some mystery novels. I can't proceed forward in Mandarin until I get the next set of CDs in the series. I was looking back at the books I've been reading lately and the most common authors to pop up are Laurie R. King, Martha Grimes, and Val McDermid. I'm new to all these mystery authors. I started out by reading a lot of Elizabeth George. Then I branched out to Laurie R. King, Minette Walters, Ruth Rendell, Val McDermid, and Martha Grimes. I like all these authors and am trying not to work through any one author's books too quickly because the last thing I want is to have read ALL of their books. I've done that before and hate the feeling of having to find something else to read because I've exhausted their books. I've just discovered Donna Leon and have started Doctored Evidence. Her novels take place in Italy and that is a nice change of scenery. It's totally lame. I just discovered that I made a typo when I signed up for my Meez acct. I signed up as "smairek" instead of "smariek". Oopsie. I've been watching lots of cooking shows lately. I've been watching Jamie Oliver's new show, Jamie at Home. I really wish he wouldn't wear knit hats as I find them very distracting. I end up staring at the hat and tuning out what he says about cooking. I start thinking about how I could knit something like that, working out all the details in my head while he's going on about mushrooms and such. Of course I won't actually follow through with knitting similar hats cuz I have absolutely no desire to do anything involving more than one color of yarn right now. I just don't want to juggle balls of yarn. Besides, I have a needle shortage. It's a side effect of having too many needles stuck on WIPs. This is one reason why I haven't knit a hat in a while. I was at Safeway earlier in the week and noticed something sneaky going on in the ice cream aisle. Do you guys remember when ice cream came in 1/2 gallons? Some years back, Breyers and Dreyers started packaging them in 1.75 quart containers. This week I noticed that the Breyers were packaged in 1.5 quart containers. I think what bugs me most about this is that it feels (to me) more disingenuous to reduce the packaging size to 1.5 qt in order to maintain the current $6.49 pricing, rather than maintain the current 1.75 qt size while raising the price to $7.57. Ah well, at least they haven't yet discontinued one of my favorite flavors, Cherry Vanilla. Dreyers discontinued that and replaced it with Cherry Chocolate Chip which I did not like at all. 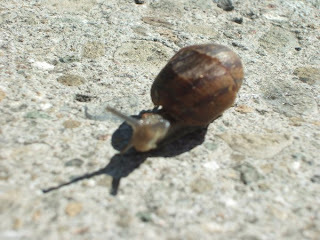 During one of Miss M's tricycle rides around the block, we almost ran over this little guy crossing the sidewalk. I was so happy to be able to show her a real live snail that was actually out and about doing its thing. I tried to take close up photos of him, but I had a hard time getting my stupid camera to auto focus. It refused to focus in "auto" mode or "macro" mode. Very frustrating. This was the best shot I could manage. I'm not very good at taking photos. 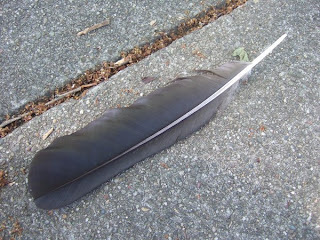 Then we went around the snail and continued around the block until we ran into a stray feather in the sidewalk. I know, not very exciting to look at. This is what it looks like when you open the doors. 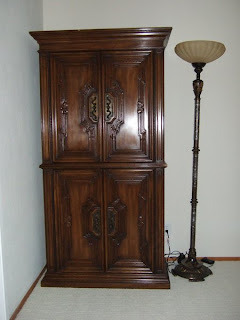 I wish the bottom half had the same cubby holes as the top half. I feel like I can stuff more with the cubby hole configuration. The drawers are very limiting cuz you can't over stuff them. 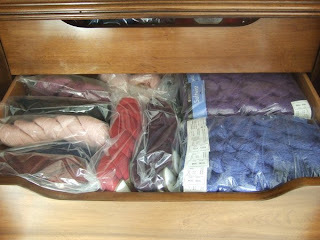 Plus it is harder to see what I have in the drawers. 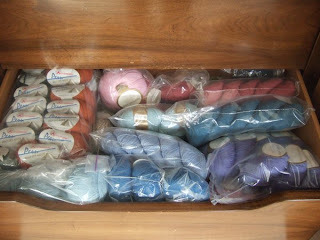 You only see the top layer of yarn when you open up the drawers, and you really have to dig down to see what's hiding underneath. 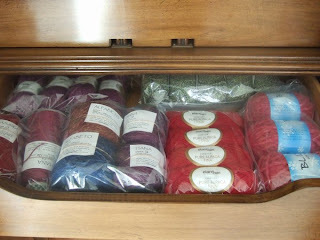 That top section contains DK weight yarn: Elann Luxury Merino Superwash (my favorite superwash yarn! ), Elann Highland Silk (discontinued, boo hoo), Online Linie Marly, Debble Bliss Merino, Filatura di Crosa 501 and Zara, Cleckheaton Country 8 Ply. 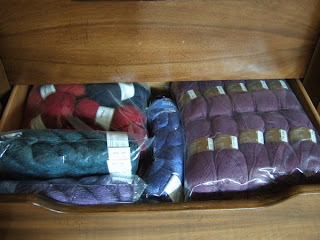 Ah... there's some yarn in here from ArtFibers in San Francisco. Barbara and Lisa dragged me over there, it's all their fault. ;-) I think that's Elann Super Tweed in green, Elann Pure Alpaca Fina, and Reynolds Blizzard. I think this is mostly Elann Baby Silk, Berroco Softwist, and I have no idea what is underneath the Softwist. I think this is all Austermann Peru and Elann Baby Cashmere. This is mostly Elann Highland Wool, and it looks like the Berroco Softwist got moved from one of the upper drawers to this lower one. 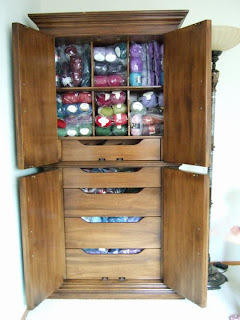 These 4 bins contain the overflow that couldn't fit into the yarnmoire. 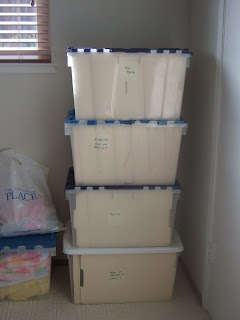 Right now I have 7 of these bins sitting in our bedroom, and about the same volume of yarn inside my closet. Sorry you can't see the yarn inside, I line the transparent sides with manilla file folders to minimize sun exposure on the yarn. I don't know if a little bit of sun hurts the yarn (fading? ), but I don't want to take any chances. And I do get quite a bit more sun in my new city compared to the old city. I've been taking a break from knitting and using the computer because of some numbness/pain in my hand/wrist/arm. I think not doing these activities has helped quite a bit. But boy am I way behind in blog reading! I've also got a hard lump inside my hand at the base of my 4th finger that is giving me some pain whenever I do anything that applies pressure to the area. If it's not one thing, it's another. Sometimes I really think I'm getting rickety and falling apart! My latest physical complaint is acute pain around my right hip when I move/bend/walk. I've got two doctors appts tomorrow, one about the lump in my hand and one follow up visit about the miscarriage. I've decided to learn Mandarin. It's partly because my in-laws speak Mandarin, and I usually feel left out of conversations because I don't understand Mandarin. I don't blame them because I understand it is so much easier to fall back on one's native language when speaking. So I'd like to learn some Mandarin so I can better communicate with them, and it would be nice to teach Miss M some Mandarin too. Although I suspect she already knows a lot more Mandarin than I do just from her visits with the in-laws. I'm picky about my language learning books. I just can't pick one of those "learn a language in 10 min a day / 1 week / 1 month" type books. There are some publishers/series I avoid in any language because I don't like the book size, binding, and content organization/presentation. And with Chinese language books, I do want somewhat proper pinyin english, not words spelled out the way you would pronounce them like you might find in a tourist phrase book (did that make sense?). If you saw my French language learning books (don't ask how much I've invested in that), they're not going to be the ubiquitous ones you can easily find at just any bookstore. My selection of Chinese books is probably similar. So the following is probably not the same set of books most beginner Chinese students would automatically flock to at first. Or perhaps the approach taken by the common choices just don't work well for me because I'm weird that way. So far, these are my picks for beginner Chinese language books and resources. I'm sure I'll add to this list as I learn more Chinese. 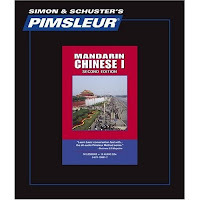 Pimsleur Chinese Mandarin, complete course in 3 volumes. It's completely audio and has no book. Thus I feel I need a good pinyin Chinese dictionary to supplement my studies here. If you want to learn Chinese characters while using Pimsleur, take a look at Taryn's Transcripts of the Pimsleur Chinese lessons. I don't know how difficult most people find Chinese. I'd say it's only moderately difficult. However I think it might be a little easier for my because I do know a little bit of Cantonese and can make some correlations between the Cantonese and Mandarin words. I have a good understanding of Chinese grammar (having taken Cantonese classes in college didn't hurt either), so what looks like funky word order (to an English speaker) doesn't seem as strange to me. And it doesn't hurt that DH and his family speak Taiwanese Mandarin. I've already discovered some differences between Mandarin spoken in Taiwan and Mandarin spoken in China. For example, in China they say pou-tung-hua (literally "common language") for "Mandarin" while in Taiwan they say guo-yu (which is similar to how we say it in Cantonese). I've already learned ee-dee-aar to mean "a little", while DH gave me a puzzled look when I said that to him, and he told me he said ee-dee-en. I'm learning nar for "where", DH says na-li. So there are some slight differences. Anyhow, I know the prohibitive cost of the Pimsleur program may make it a less popular choice for people who are casually thinking about learning a language (and perhaps this is why I never see the "full" courses sold at bookstores, only the "short" courses if they have it on the shelf). Try your local library, you might get lucky and find all volumes of the full course of whatever language you are interested in. 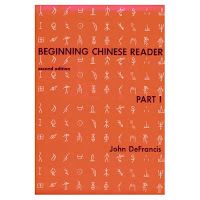 I also have this book, Beginning Chinese by John DeFrancis, which I am using concurrently with Pimsleur. I think it is one of the better Chinese language learning books out there. Don't let the fact that the author is not a Chinese dude turn you off from this book. Just get over the old-fashionedness of the book. It's not exactly one of those easy/fun modern reads, but the repetitions, presentation, and learning notes are efficacious. I need some sort of book so that I can see the words I'm trying to say. Seeing the pinyin words in print helps me remember words and phrases. I can't describe how that works, but that's what I need to learn a language. I can't do it strictly through audio. The only tricky part is finding the time to sit down and read the book. Now I need a good pinyin dictionary and am considering these as portable options. I'm looking for a pinyin dictionary, not a Chinese character dictionary. Collins Chinese Concise Dictionary. This is Chinese-English and English-Chinese. Oxford's Beginner's Chinese Dictionary. This is Chinese-English and English-Chinese. 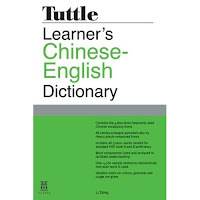 Tuttle Learner's Chinese Dictionary, which is Chinese-English only (which is why I also needed another dictionary that offered English-Chinese). I would like to learn the Chinese characters after getting some basics down and learning how to speak the language. I know some people want to do all this together. I think it would be easier for me to tackle them separately. 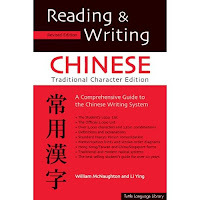 Reading and Writing Chinese (traditional characters version) by William McNaughton. I want to learn traditional characters because that's what my Mom learned in Hong Kong and what my MIL knows. Besides, I figure it's easier to learn the simplified characters after learning the traditional ones, but not so easy the other way around. 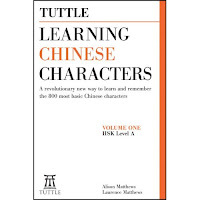 Tuttle Learning Chinese Characters, which would add a bit of "fun" to the mix. 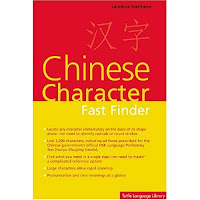 Chinese Character Fast Finder. 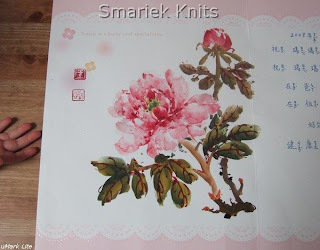 I would also like to add this book, which I've looked at and and tried out with a few Chinese words. It lives up to its name and really does help you look up Chinese characters fast! 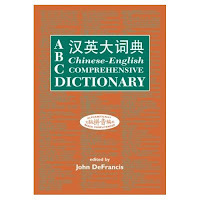 ABC Chinese-English Comprehensive Dictionary by John DeFrancis. Although I can probably get this now, it's just that it is an expensive book! 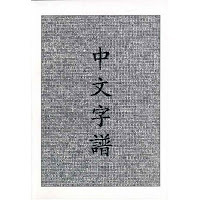 Chinese: A Comprehensive Grammar by Yip Po-Ching. I'm expecting this book to be just as good as the Steven Matthews / Virginia Yip series of Cantonese language books, like Cantonese: A Comprehensive Grammar. Actually, I'd recommend any of Virginia Yip's books on Cantonese, they're excellent. I'd love to hear your tips for learning Chinese. 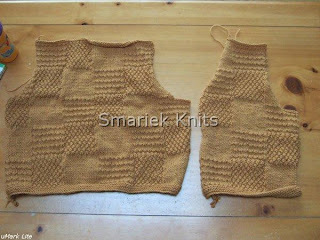 Yay, I finally finished the Left Front section of my mom's vest, using the plan I outlined in this post. I went ahead and worked it that way, with the 10 decreases instead of the 11 decreases specified in the pattern. I think/hope it will work out OK in the end. 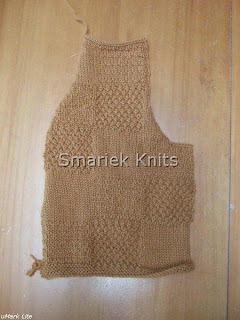 Now how many months will it take me to start and finish the Right Front section of this vest? I'm also working on a scarf for my MIL. I have no photo of it and am not inclined to take one until it is done because it is red and I always have such a hard time getting red colored knitting to look good in photos. 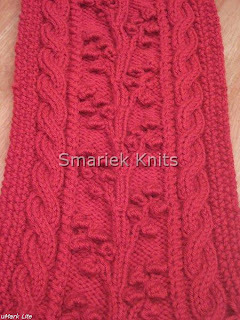 It's just the Regina Scarf, knit in the same yarn in red. So just imagine that pink scarf in red. It was a remnant ball of yarn, not a full ball. I knew there would be enough yarn because this is a smaller cloth. 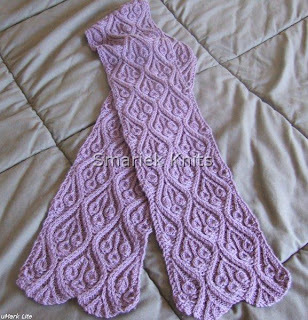 I think most people would prefer a slightly larger cloth, another repeat of rows 1-12 would make it taller. Casting on 46 stitches would make a wider cloth. 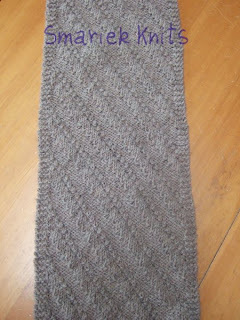 In retrospect, I think I should have made the top border "knit 4 rows" instead of 5 rows. But this was one of my earlier attempts at a dishcloth and I guess it really sucked cuz I don't think I've ever seen anybody attempt to knit it. LOL. The cloth above shows a 4-stitch wide garter border; the original pattern has a 3-stitch wide garter border. No clue why I did that for this cloth. Nope, I don't use my dishcloths as dishcloths. I'm a sponge gal when it comes to washing dishes. However I use these cloths everywhere else around the house. I was thinking back on how I started to use them as mug coasters on the kitchen counter. I think it was back when Miss M was very young. I would often hold her while she is drowsy or sleepy, and I didn't want the sound of setting a cup down to wake her. So I'd place the mug on a dishcloth, nice and quiet, doesn't wake sleeping baby. Cuz Rule #1 is to never wake a sleeping baby!!! 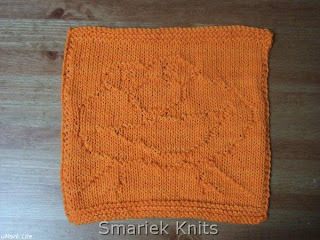 I put my teapot on a dishcloth for the same reason. This is why most of my dishcloths have permanent tea stains on them. My latest thing, since I have lots of blinds and shutters in our new house, is to use the cloths with a lot of texture for cleaning window blinds and shutters. Used slightly damp, they work great for picking up the dust! This is a photo of how much yarn was left over when I finished this cloth. It is definitely not enough to do another repeat of 12 rows. This is a smallish cloth, about 23 cm wide and 18 cm tall (~9 in x 7 in). All my cloths shrink in the wash. Does this happen to everyone else too? Anyhow, this will be the perfect small cloth after washing, I'll use it as a mug or teapot coaster. I guess that sounds weird to use it as a mug coaster, but you need to know that I use large mugs with a 9.5 cm diameter (~ 3.75 in). Those small coasters made for "standard" size mugs are just too small. I think anyone with kids will immediately identify this as Elmo from Sesame Street. Elmo is one of Miss M's favorite characters. I didn't have any red yarn, so I grabbed a ball of orange instead. You'd think that in this day and age, someone who owns a computer would also own a printer. Well, that's not me. I have a computer, but no printer. 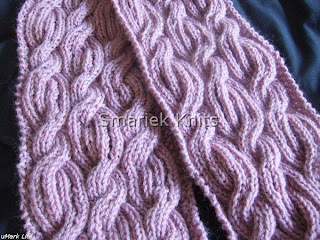 So I worked on this cloth with the laptop on the coffee table and my web browser open to the pattern page so that I could knit up this cloth. In some ways it made it easier in that I could use the mouse to highlight the line I'm working on. I made two of these cloths using the same wine colored kitchen cotton yarn. 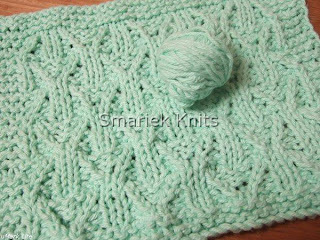 The only change I made was to work 4 rows of garter stitch for the top border instead of 5 rows. 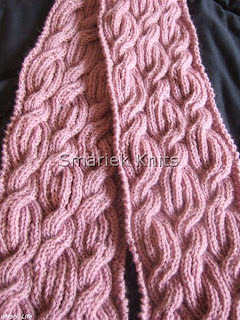 Now that I'm looking at this photo, I realize that I should have put the other cloth on top because that one was knitted more tightly which made the crossed stitches look better. Knitting too loosely is one of my problems.